Very few photographs exist of the mysterious interrogators from Camp 020, also known as Latchmere House, Ham Common or simply Ham. In May 1941, with the help of Josef Jakobs, Camp 020 interrogators finally broke newly arrived spy Karel Richter. On the morning of 18 May, Richter reluctantly admitted that he had arrived by parachute. A field trip to London Colney (where Richter had landed) was quickly arranged that afternoon. Dr. Harold Dearden, the resident doctor at Camp 020, came along and brought his camera for good measure. Short, Goodacre, Dearden and Superintendent Reeves. One of the photographs taken by Dearden captured five of the primary interrogators at Camp 020 in 1941. All of these men were involved in the interrogations of both Karel Richter and Josef Jakobs. Some authors have added Lt. Col. William Edward Hinchley-Cooke's name to the expedition but from the above report by Stimson, it is clear that Hinchley-Cooke was not present. 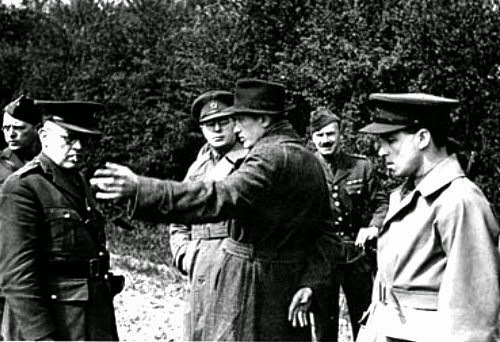 Camp 020 interrogators and German spy Karel Richter, 18 May 1941. In addition to the men pictured above, two other officers were involved in the interrogations of Josef and Richter, Lt. A.D. Meurig Evans and 2nd Lt. T.L. Winn. While much has been written about Stephens, finding information on the other officers is a bit more of a challenge. Over the next few posts, I will share the information that I have gleaned about these men. First up, Lt. G.F. Sampson.